Mom, the Intern: Birthday overload. Every year when March rolls around, I find myself in a panic. In our family, we have three birthdays all within two weeks of each other (Audrey is the Lone Birthday Ranger, waaaaay out in October). Despite this, we still try our best to make each person's special day ... well, special. This means separate cakes or pies, separate parties, separate outings, separate birthday songs ... all of it. I grew up having to share a birthday with my twin brother because hello, we were born on the same day. But my parents did a great job of making us each feel extra-special on our birthdays and giving us individual attention anyway. It meant a lot to me, so I try to do the same for the members of my family. The new baby will also be born sometime in late April-early May. So basically, March and April are birthday overload season for us and will always be. It is a little stressful, but mostly awesome. Last week, Dill took Monday off for Carson's 4th birthday and Friday off for his own. It was fun to have him around a lot, especially when the weather is beautiful (have to soak it all up before the wrath of Hades descends upon us in a few weeks). We traditionally go to Joe's Farm Grill in Gilbert for breakfast on our birthdays. If you bring your ID or your kid's birth certificate on the actual birthdate, they give you $10 off your ticket (works at Joe's Real BBQ, too). This is an incredible deal because their menu items are reasonably-priced to begin with. Plus, Joe's is a fast-casual establishment, which means no tip. Their gloriously huge, perfectly soft-yet-crispy Belgian waffle is my absolute favorite, and the berries they put on them are the freshest and most flavorful I've tasted. Add some fresh whipped cream and pure maple syrup ... it's basically heaven. And it only costs $6.99. So, you do the math. 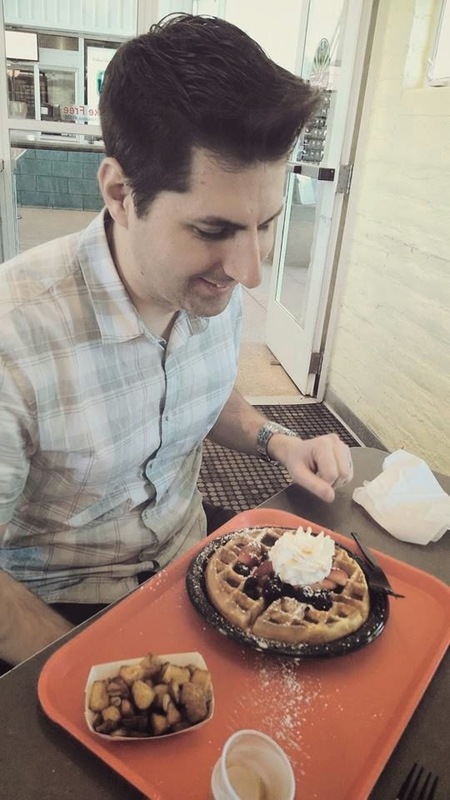 FREE CELESTIAL WAFFLES ON YOUR BIRTHDAY! 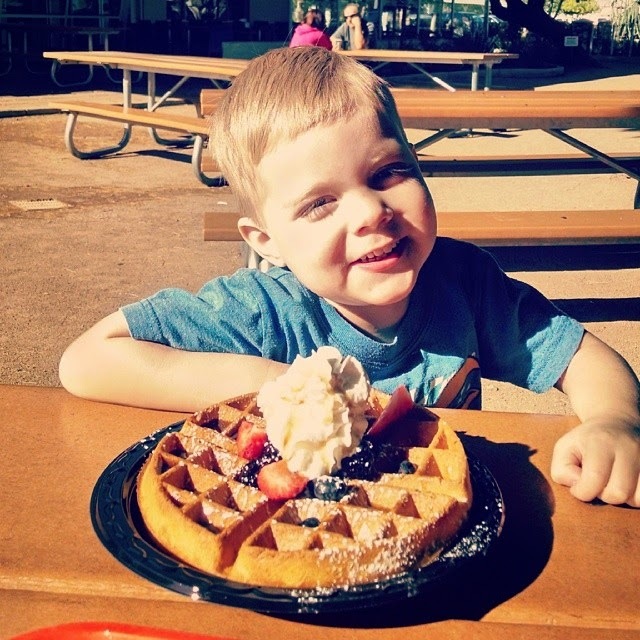 Little Carson sure enjoyed his birthday waffle. Yum yum. Dill and I went back for round two on Friday, since that was Dill's actual birthday. And yes, I did get a second waffle. Because why not. Plus I'm now 36 weeks pregnant. I do what I want. Go big or go home. That's my motto. Dill's mom watched Carson so we could dine in peace and see Divergent afterward. Good book-to-movie adaptation, I thought. It was entertaining. Though, I always forget how horrible it is to sit in a movie for two and a half hours at 9 months pregnant. Good thing the theater was practically empty because yes, I did eventually lay down across three chairs to get some relief. 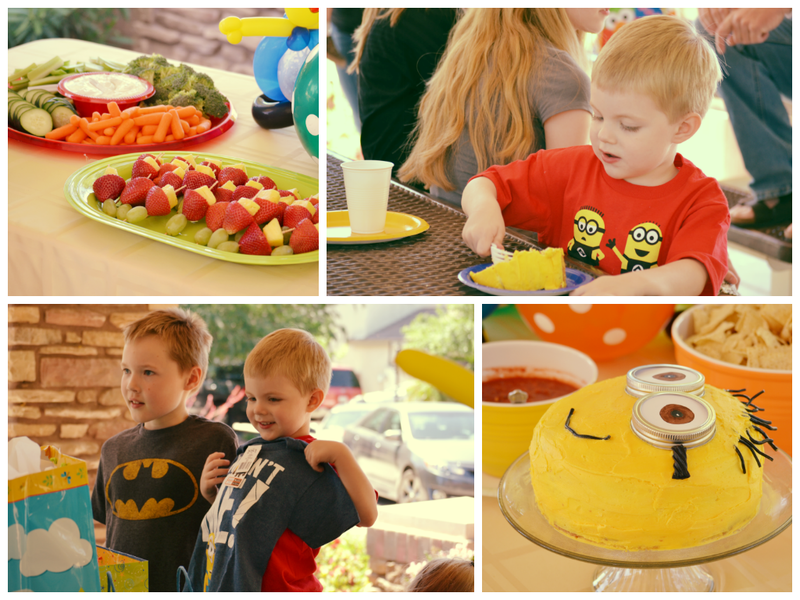 Saturday, we had that epic minion party for Carson. It actually did turn out pretty well, all things considered. I made a minion cake that surprisingly looked really cute (I used mason jar rings to make the eyes -- an act of brilliance for my pregnant self). We got a few pies from Village Inn since Dill and his family are pie people. By the way, Lemon Supreme is a magical pie that you must consume at your earliest convenience. Holy crap. We partied at the park by my parents' house so the kids could roam free and have fun while the adults socialized in the perfect weather. It was great. 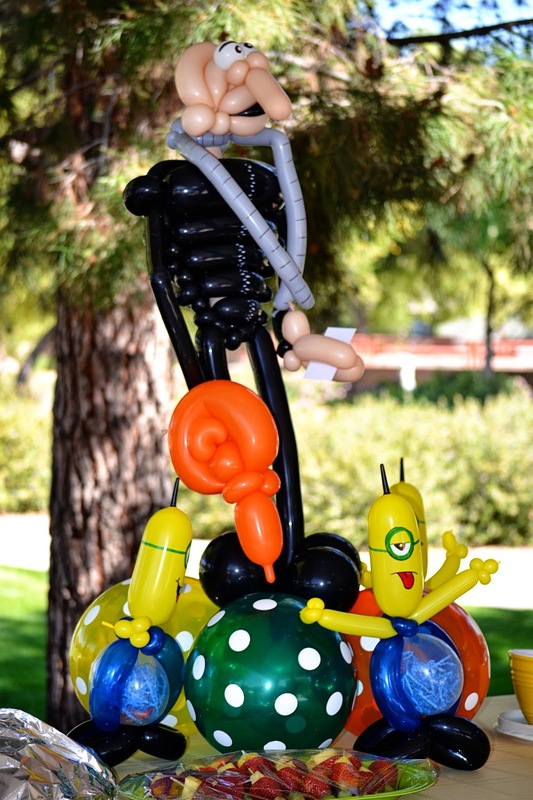 The best part was probably the Gru balloon sculpture and minion "balloon buddies," provided by Eileen's Balloons. My grandfather had won a party package from her at a fundraising auction and gave it to us to use for this party. Sadly, though, Eileen was already booked during our party, so she made the balloons in advance and offered to come do a private balloon twisting for us on a different day. Look how awesome they are! Each kid got to take home a minion buddy ... the clear center balloon contained party favors and fluffy confetti. Seriously, the cutest thing. She also made a bunch of swords which were a huge hit. What kid doesn't love to whack people with a balloon sword? All told, it was an exhausting but fun week. My birthday is on Monday and my bestie MoniQue and I are going to the spa to celebrate. Can't even wait. This pregnant lady needs some pampering!